Last week, Food for the Hungry (FH) staff and Keyla Bermudes, Miss Guatemala World 2014, showed up with 100 cupcakes at TELUS international, the largest Central American call center based in Guatemala. With more than 2,000 young employees at the center, we sold these tasty treats to raise money for the education of 38 children in the community of Satexa. In the rural areas of Guatemala, 75 percent of the people living in communities like Satexa are illiterate. Only one out of 10 children attends middle school. The lack of money pushes families to encourage their children to work instead of attend to school. But this just feeds the vicious cycle of poverty: if kids don’t go to school, they will never be able to work in a formal job. In response, FH developed a creative educational program called “Manitas a la obra” where children have fun learning to read, write and solve math problems using songs and interesting games. To start and run the program, we need to raise $650 for teaching and classroom materials. 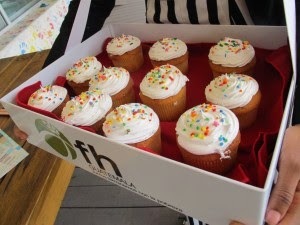 In our charity cupcake sale, with the help of Keyla, cake shop Ciro who provided the cupcakes, and our FH team—we sold all the cupcakes in less than three hours, raising $130 to start buying materials! The young people from TELUS were hungry not only for the cupcakes, but to help 38 children have an education for a better future. We still need to raise more money to start this program, so let’s put the “fun” back in fundraising! Please help us by doing your own fun activity to change the future of these children or consider sponsoring a child. Here in Guatemala we will keep doing it until we reach our goal!